Buses 149, 259, 279, 349. North London's largest artist-led studios is opening to the public. Enjoy a drink, meet and network with talented artists. Buy or commission original exciting artwork. 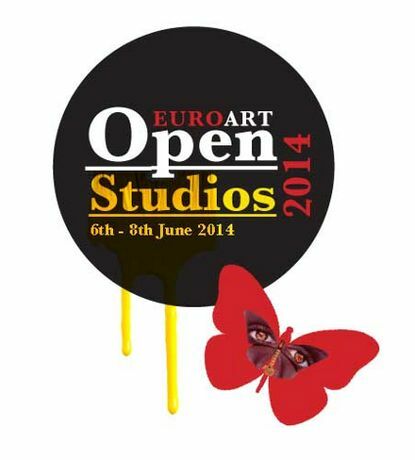 There is a chance to win a £250 art voucher and take part in a silent auction. Affordable artworks are installed on a wall, each with an accompanying 'Bid Sheet' containing details of the work and the creating artist. On the sheet is the start price of the auction and spaces for visitors to record higher bids & their contact mobile phone number. At the end of each 2-hour period, Euroart's auction coordinator will contact the highest bidder to return to the auction wall, to collect and pay for their purchase. The Silent Auction is not supervised so visitors are free to view the artworks and place bids at their leisure. A chance to win a £250 Voucher Prize which can be used to buy work(s) from the 'Silent Auction Wall', in artists' studios or to commission new work. The prize voucher does not have a cash value. The raffle will be drawn at the bar (on the main landing) at 5pm Sunday 8 June. A projection of photomontage images by 150 international artists, created and curated as a London Biennale 2014 Pollination project by Raffaella Losapio the director of studio.ra Gallery, Rome (twinned with Euroart Studios). Euroart Studios, Units 4, 5 & 6 ' Gaunson House, Markfield Road, Tottenham, London, N15 4QQ.